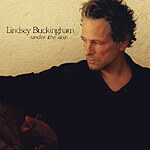 CD review: "Under the Skin"
No, it's not fair to chain Lindsey Buckingham to the accessible, radio-friendly pop-rock he created with Fleetwood Mac in the 1970s and '80s. A musician has to play what he feels, after all. And the Mac had gotten a bit formulaic by the mid-'80s. But it's tough to think of anyone else who's transitioned so completely from writing and performing bright, melodic pop nuggets to turning out difficult to grasp, often dense music meant for hard-core aficionados more than the general public. Even Peter Gabriel's move was less jarring when he left Genesis; Sting had nothing on Buckingham in his post-Police period. Buckingham's latest solo album is always experimental, often interesting and consistently virtuosic. But for casual fans who know him for what he did 20 years ago, it's also going to be mostly unlistenable. Let's be honest: If atonal, dissonant music with sudden time and key changes, vocals run through effects boxes, and a noticeable lack of melody appealed to most music fans, Yoko would have been the famous one, not John. Buckingham remains one of the most talented and intriguing guitarists in rock music, though  give him that. No matter how weird "Under the Skin" gets (and it gets mighty weird at times), if you love great guitar playing you'll be unable to stop listening. And that weirdness isn't simply random or defiant  it seems pretty clear that Buckingham is aiming to create something greater than another Top 40 hit  one can hear echoes of Zappa and Roxy Music and King Crimson in this album. He's trying to push the music somewhere new. If Buckingham feels constrained by the limitations inherent to popular music, he's yet to synthesize his talent and interests in something better than that which he rebels against. Not to say he won't break through with music both listenable and transcendent  but this album isn't it. Fans of experimental music and/or great guitar playing will dig what's here; Fleetwood Mac fans hoping for a taste of the band's possible future won't find it.